Today’s messy situation is brought to you by Carissa! 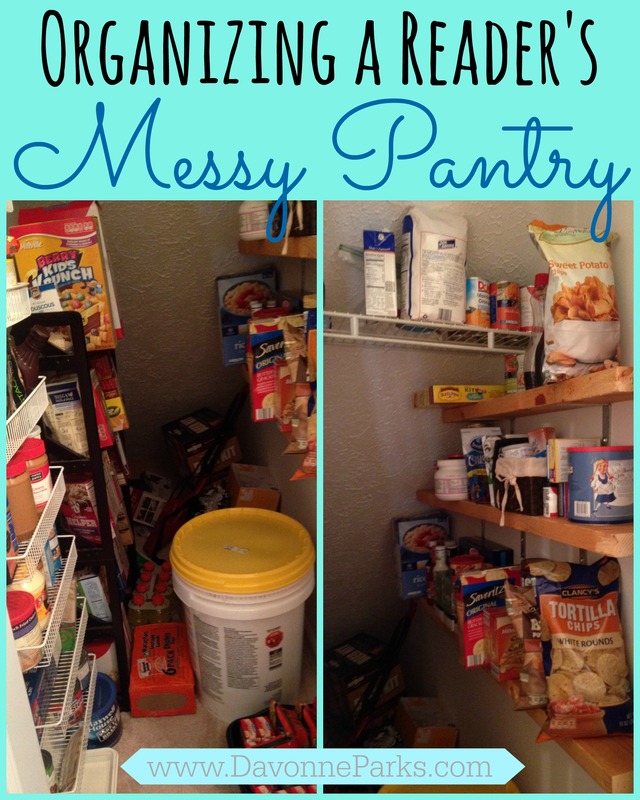 “I have a horribly unorganized pantry. As you can see from the photos, we are working with a small pantry space that is situated under our staircase. One problem we face is that this is the only room in the house without windows, which means this has to be accessible as a safe space during our fairly frequent tornado warnings. We need to be able to walk in if needed. Thanks so much for e-mailing me, Carissa! I’m happy to help! Problem 1: Our big issue is proper shelving and working with the small angled space. How would you make use of wall storage so it is possible to keep things tidy and off the floor? Solution 1: Carissa, I can definitely understand your dilemma here! Those shelves on the right-hand side look very narrow. First of all, throw away any expired items. To get things off the floor, you could also maximize wall space by adding narrow shelves to the back sloped wall, like this one that I found on houzz.com for you. Problem 2: It is currently really hard to see everything we have, and we end up buying things we already have simply because it’s hidden. What would you do to group like items? Solution 2: Use cookie tins, baskets, or plastic containers to store like-items, and label the containers! I have photo examples of this in an article I wrote about how to organize your spice shelf and baking supplies. I also found several examples of what I’m picturing and pinned them on my kitchen pinterest board for you! Problem 3: We are storing our dog’s food in the 5 gallon bucket. Should this even be in the pantry? Or is there a pretty way to hide this? I hope this helps you, Carissa! I can’t wait to see your organized pantry! If anyone else has tips or ideas for Carissa’s pantry, please let us know in the comments!